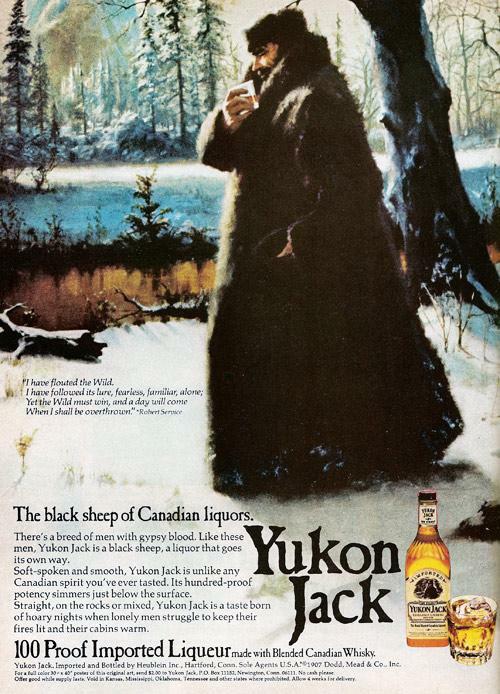 Yukon Jack is a liqueur advertised as the "Black sheep of Canadian Liquors". It is a 100 proof (in USA) or 80 proof (in Canada) drink, made from Canadian whisky and honey. The taste is sweeter than straight whisky and bourbon, due to the honey that is added. Yukon Jack was formerly imported to the USA by Heublein Inc. Heublein was later taken over by Diageo. Yukon Jack has been selected as the regimental liqueur of the South Alberta Light Horse. This commemorates the stationing in Whitehorse, Yukon in the 1950s of one unit of the regiment's predecessor, the 19th Alberta Dragoons. As on the bottle: "A taste born of hoary nights, when lonely men struggled to keep their fires lit and their cabins warm. Boldly flavorful, yet surprisingly smooth. There is no spirit like Yukon Jack." Mint lovers sing the praises of the unique, one-of-a-kind drink, Yukon Jack Perma Frost 100 Proof Peppermint Schnapps. ... It can be difficult to tell when you take a sip of this refreshing spirit consisting of a delicious frosty peppermint base infused with a trace of hot cinnamon.